That is a big claim for bike that will cost you about 2 grand. Did I mention that it was steel? oh yes, but not just “any” steel but Columbus Spirit Steel. 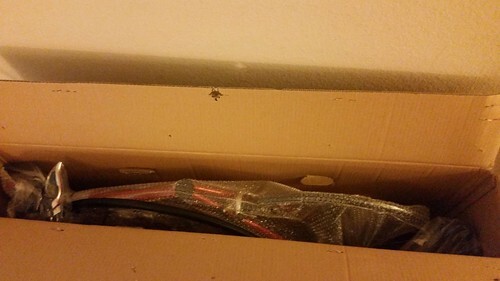 For starters, the bike came well packaged and protected in a box via Fedex. It is also worth noting that the bike was pretty much 90% assembled, a simple hex tool was all I needed to put the bike together. As soon as the bike was assembled, I couldn’t help to notice how beautiful the bike is. The frame is traditional with a carbon fiber fork, the parts are polished and that Red… quite captivating. The bike got a few compliments as I was riding the bike to the beach, it is definitively a looker. There is one thing about this bike that I’m still on the fence; the Microshift Centos shifting components. 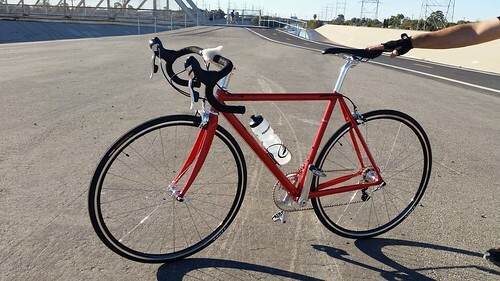 I’ve never heard of Microshift before, a quick google search yielded few results, some of these results comparing this grouppo with Shimano 105s. Well, my current bicycle is equipped with 105s so a comparison will be a must. So what about that claim that this is going to be the most comfortable bike I’ve ever ridden? So far it is totally true. The bike blew my mind, I just could not believe how different the ride is from my Giant TCR SLR 2. The ride to and from the beach is relatively flat with minimal shifting and braking so I still need to put the bike through some uphills and descents. Stay tuned for my full review. Ever wanted to repaint you bike? Maybe your bike’s got too many scratches or maybe you’re just tired of the color. I know I’ve had that feeling several times. Being a frequent Craigslister, I’ve owned a few bikes that I wish had a different color–the bikes rode great but the color was sometimes just drab or depressing. 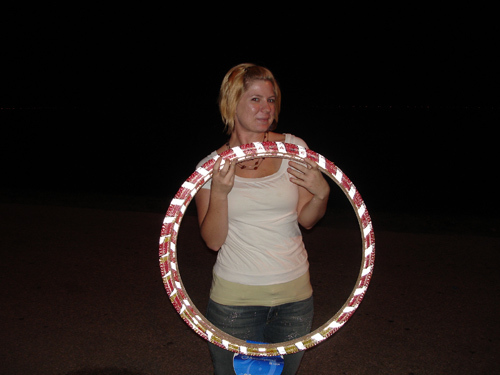 So, when I became a writer for this site, I had to come up with ideas for articles and repainting was one of them. So here it is! After getting over my fears, I now can share my experience of how I repainted my bike. 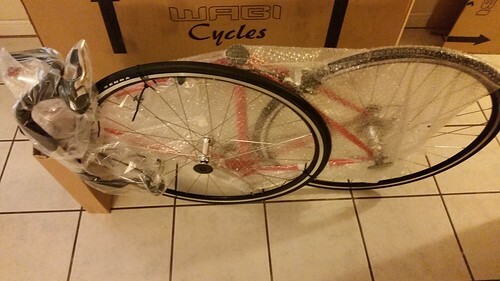 About a year ago, I bought a “parts bike”–a bike to harvest parts from–to install on another bike. Since then, the bike has rarely been used and as a result, it’s just sat in my garage. I went on YouTube, and asked RL, to get a better idea of what to expect. The process (which I’ll break down later) was surprisingly easy. I went online and followed the instructions I found both from mtnbikeriders.com , ehow.com and a couple of youtube videos. After disassembling (which was not as easy as I thought), I read the instructions on the paint stripper can and it was scary! I had to use a mask to not inhale dangerous fumes and use solvent-resistant gloves! Using a putty knife, I easily removed the paint. But since the previous owner just painted over the original paint of coat, I had to use two cans of the paint stripper. After sanding down the frame with fine and extra fine sandpaper, I was ready to paint. The sanding was very cumbersome because of hard to reach parts like where the derailleur cable goes but it only took about eight hours spread over a couple of days. After that, the repaint was easy–laying down plastic to make sure that the spray paint doesn’t get all over the place, I sprayed four coats over four hours (that means, 4 coats with dry times of 1 hour each). And since I used a spray paint that combined the primer and paint in one, I was able to skip 2 coats of primer making my job a little easier! FYI: the guy at Home Depot just suggested the primer/paint combo without a finish to be sufficient. One minor setback happened–some debris made it onto the paint in the threading where the rear derailleur goes so when I attempted to reinstall the rear derailleur, it was at an angle. This damaged the first 2 or 3 threads so I tried to thread it in between the drop outs, as opposed to outside of the dropouts hoping that it would fix the thread. It didn’t so I was off to the bike shop. Now the bike shop didn’t have a metal tap or heli-coil to fix the stripped threads so I was advised to buy a bolt of the same size as the derailleur bolt from a hardware store to fix the thread so I did. I screwed in the bolt from the inside (in between the drop outs) and it fixed it! I installed the rear derailleur and put together the rest of the bike. I also used, a painter’s sheet of plastic (1.50 at home depot) which I recommend but it’s not necessary. Remove crank, fork, pedals, wheels, brakes, cables, derailleurs, seatpost and handlebar. 2. Spray paint stripper on fork and remove paint using putty knife. Repeat if necessary. Sand down to get a smoother finish. 3. Spray paint stripper on frame and remove paint using putty knife. Repeat if necessary. Sand down to get a smoother finish. Sprayed a pretty thick coat! It’s been a few weeks since my first mention of the Day6 Bicycles, Dream. I’m quickly starting to fall in love with this bike. Not only is it a great comfy ride, but the bike it self gets plenty of attention while I’m on the road, I figure, the more people checking out the bike, the better…why? It means they are seeing me. Just because the Dream has a recumbent look and feel, it doesn’t mean that its not practical for daily riding or using for errands. Just today I spent the afternoon with my kids riding bikes and we even went out to get some ice cream. Just look at the beefy tubing that this bike is built with…that speaks longevity to me. One of the fun factors about this bike is that you can really lean into the turns. All I had to do was use my hips and the bike followed. Even my 12 year old has been enjoying the Dream. Another great feature that I mentioned last time was the built in bag/pannier that the Dream comes with. You can pretty much see it in this photo, but I kept my camera, keys, wallet and bike lock in it the whole time. Remember once we’re done with this review, you do have a chance to own it. We’ll provide more details as time nears on how you can own this particular Day6 Bicycles Dream.